In this vivid and thoughtful solo exhibition Nocona Burgess presents strikingly modern depictions of Indigenous men and women from the tribal Nations of the Southern Plains. These paintings mix careful research, firsthand knowledge and raw passion. By combining brightly coloured shapes with crisply outlined facial features and traditional dress, Burgess explores the cultural context, life story and identity of each sitter. In this way, the artist urges us to update our perceptions of Native people and consider the intriguing and often highly politicised place of Native American portraiture. Burgess is a member of the Comanche Nation of Oklahoma. He is the son of a former tribal chief and the great-great-grandson of one of the most revered Native American leaders, Chief Quanah Parker. Burgess grew up surrounded by art. His father went to art school to focus on drawing and painting, and his grandparents made quilts and beadwork from their own designs. In 1989, Nocona Burgess fully developed his artistic talents at the Institute of American Indian Arts (IAIA) in Santa Fe, NM. He was fascinated by how more traditional forms of Native art evolve into contemporary movements. This fascination came to define his focus, leading him to reinterpret traditionally inspired portraits with his own modern slant. It is the notion of the modern Indian that he seeks in his work and recognises in himself. 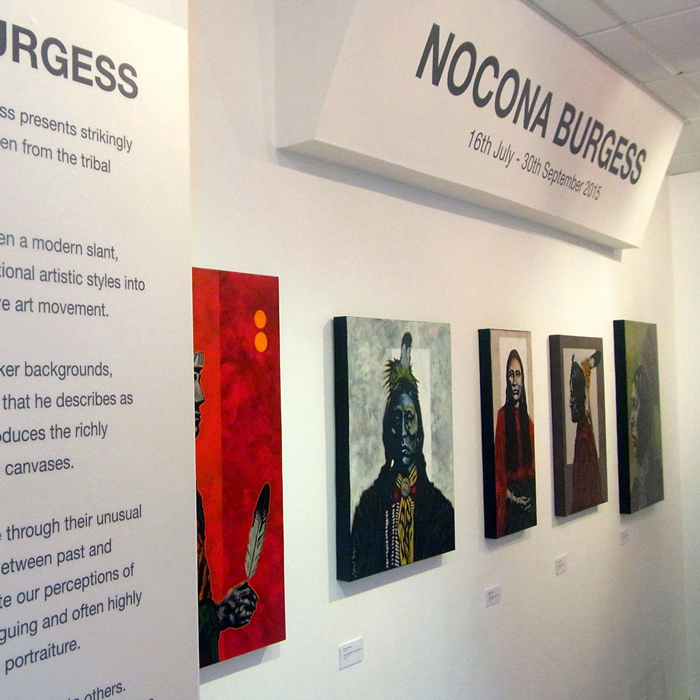 Nocona Burgess’ paintings have received numerous awards and have been featured in many publications. He exhibits throughout the USA and beyond and this summer alone sees his paintings in Australia, England and America. They can also be found in the permanent collection of the Smithsonian Institute’s National Museum of the American Indian in Washington, DC. His numerous collectors include the actor Johnny Depp.